Starting off with the cold section, the Ice Bar is your chance to get out of the hot and humid heat, don a cape and furry hat and cool off in the minus seven degrees Celsius. The walls, bar, sculptures and seats are made entirely of ice, as are the glasses you drink from. There is little point having anything on the rocks here! This incredible 900 square feet bar has a life size ice tuktuk, dragon and many other sculptures ideal for memorable holiday photos. The infused vodka flavours are not to be missed and unlike anything you have tried before. Getting slightly warmer, just outside the ice bar section is an indoor air-conditioned lounge bar that is the perfect place to enjoy a drink.So what is on the menu? Well there is an impressive cocktail list, all of the beers, ciders and spirits you would expect to find and a whole host of specialty shots. For the non drinkers there is a range of virgin cocktails and soft drinks available too. Getting a lot warmer outdoors you will find a fabulous outdoor tropical garden that has comfortable seating, relaxing sofas and private comfortable bamboo salas. 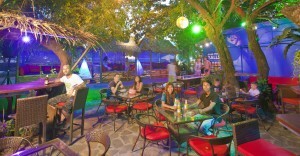 A wonderful ambiance, It’s a fantastic place to socialize with old friends and meet new ones. Challenge your friends to a game of pool or for the more adventurous , perhaps a game of beer pong, The original favorite drinking game of many. The other surprise here is Magic Lee who will add a certain je ne sais quoi to your evening with his close up magic tricks and crazy balloon modeling after 8pm. The Ice Bar is a really great place to hang out and with your VIP Resident card that gives you 25% offfor you and your friends,it is a really affordable place to hang out too. The lighting, the music, the layout and the atmosphere are all spot on and offers something just a little bit different from the regular chaweng night spots. The Ice Bar welcomes people from all walks of life and of all ages. Its a great place to hold parties, hen and stag nights or corporate events.Family deals are available from 4pm to 730pm and children never seem to get bored of the dressing up, or the ice bar. Parents can also relax knowing they are in a safe environment and being well looked after by the friendly staff. Your 25% off VIP resident discount extends to the official merchandise too so while you are there why not treat yourself to Fur and Faux fur hats, beer coolers, singletsand T-shirts, to remind you of your visit or, for your friends to take back home with them.